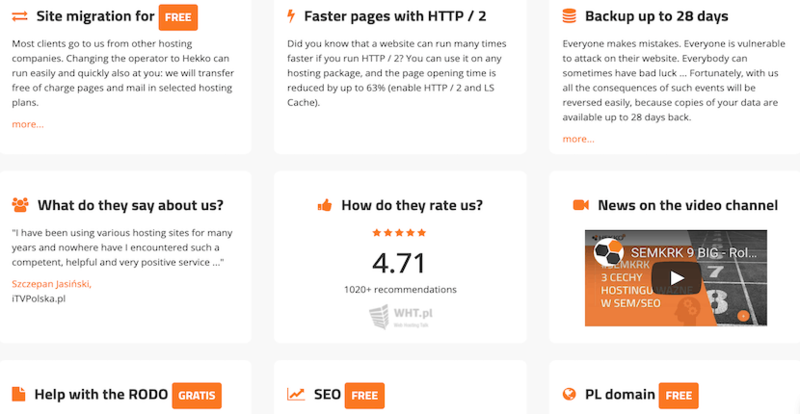 Hekko Review 2019: Is Hekko a Good Hosting? Based in Poland, Hekko offers a free 14-day trial, free SSL certificate, and free domain with some of their shared hosting plans. Extended 28-day data backups are available. Founded in 2007, Polish hosting provider Hekko (short for Hekkonet) provides shared website hosting, VPS hosting, dedicated server hosting, and reseller hosting plans. The company also offers domain registration, SSL certificates, and SEO services. It has a customer base of several thousand. Hekko’s data center is in Gdańsk, Poland. The company’s website and services are offered in Polish. Hekko offers four levels of regular shared hosting. These are the Student, Start, Business, and Pro plans. The entry-level Student plan includes a relatively small amount of data and features: 2GB of disk space, hosting for one domain, one MySQL database, and three email accounts. Customers with greater requirements may opt for the Start or Business plans instead. The Business plan features 50GB of disk space, hosting for unlimited domains, unlimited databases, and unlimited email accounts. The Start, Business, and Pro hosting plans all include a free SSL certificate from Let’s Encrypt. Additionally, premium SSL certificates are available for purchase and include Thawte SSL 123, RapidSSL, RapidSSL Wildcard, GeoTrust QuickSSL Premium, Certum Commercial SSL, and SuperFAST SSL Wildcard. Hekko doesn’t explicitly state an uptime guarantee, but it does host its customers in a Tier III data center in Gdańsk, Poland. This means that you’ll have a minimum uptime of 99.982%. The data center facility also has two fiber optic ring connections and redundancy of network devices. Protection systems are in place for fire prevention, and there are redundant electrical supply and cooling systems. Pricing for Hekko’s shared hosting plans is affordable and fairly competitive with other European and international providers. The second-tier Start hosting plan is particularly great value for small businesses, since it comes with a free domain registration and SSL certificate. You’ll also find that the initial pricing is heavily discounted during the first year. If your business is heavily reliant on its online presence, however, I’d recommend at least the Business hosting plan. This gives you access to extended backups and a dedicated helpline — otherwise, you’ll only have access to customer support during business hours on weekdays. All shared hosting plans come with a 14-day free trial, allowing customers to test out the service before they pay. Hekko also offers a loyalty program and a barter program. The loyalty program rewards customers with a 2% discount for each additional year they host with the company, topping out at 20%. The barter program offers customers a 20% discount on service in exchange for placing a Hekko banner advertisement on the customer’s website. Customers with websites drawing more than 1,500 unique visitors per month are qualified for this program. Customer service is slightly disappointing. This is handled only via telephone and contact form, with telephone support available from 8am-6pm on weekdays (Polish time). A dedicated hotline is available as an add-on purchase. Unfortunately, after I reached out to customer service, I never received a response from customer support (besides the automated reply letting me know that they’d respond). This might be because customer support is only available in Polish and I emailed in English, however. Hekko provides shared, VPS, and dedicated hosting with a number of features that customers may appreciate. Pricing is competitive for the level of features on offer, though you’ll have to go for a higher-tier package if you don’t want to be handicapped with limited support. Wondering how Hekko stacks up against other Web Hosting companies? Enter any other Web Hosting company and we will give you a side-by-side comparison.